In popular religion and culture ‘apocalypse’ refers to an end-of-the-world scenario where the order and stability of life as we know it breaks down, stars fall from the sky, evil powers are unleashed, and zombie herds ravage the few unlucky survivors. Even in ancient religions we can find this dystopian picture of catastrophic destruction and world-collapse, signalling the finale of temporal existence. The curtain comes down and the lights go out. There is good evidence that the Persian prophet Zoroaster may have been the first to treat the Apocalypse as a future event rather than a mythological device announcing a phase transition from one mode of consciousness to another – which I will explain shortly. Zoroastrianism inspired similar prophecies in late Judaism and early Christianity, leading up to our own evangelical end-timers as its present-day descendants. Zoroaster divided reality into two absolute and opposite principles: Ahura Mazda, the personified principle of light and righteousness, versus Angra Mainyu, the principle of darkness and evil. The human situation was thus characterized as caught in a cosmic-moral conflict, with each principle vying for our devotion and allegiance. Zoroaster’s division in the very nature of reality was the cosmological projection of a psychological shift in human consciousness, in the formation of that separate center of personal identity which we know as ego. Instead of the seat of immortality that Zoroaster presumed it was, contemporary schools of ego psychology are approaching agreement in their regard of it as a social construction – not immortal or even all that self-consistent over an individual’s lifespan. Ego formation is the process whereby a human animal is shaped by his or her tribe into a person, a term tracing back to the Latin persona and Greek prosopa, referring to a mask actors wore on stage to ‘personify’ the characters of a play. By constructing an identity and assigning roles for the individual to play, the general role-play of society could be carried off with functional success. Intrinsic to this process of identity-formation was the individual’s gathering sense of him- or herself as a separate center of affection, perspective, and agency. Standing in its own unique (but socially invented) space, an ego must identify itself with certain things and against others, in commitments that are mandated and closely managed by the tribe. Around this center of personal identity everything seems to fall very naturally into pairs of opposites – outside/inside, above/below, behind/ahead, right/left, self/other, mine/yours, us/them, good/evil. And since the individual’s obedience to the moral code of the tribe is so essential to the tribe’s cohesion, it was Zoroaster’s genius to invent a cosmology that turned around – and in turn motivated – each person’s moral behavior. How does dividing reality into opposing principles of good and evil motivate moral obedience? By making the ego immortal, Zoroaster made it all very personal, since the question of the individual’s postmortem destiny was now suddenly relevant and unavoidable. He preached that only obedient and righteous believers (those who believed his myth and its message) would enjoy an everlasting bliss in the paradise of Ahura Mazda, while doubters and sinners would be tormented in hell forever. Apparently his motivational system worked, for many submitted themselves to the moral code and its unforgiving orthodoxy. The priests and prophets who spoke for Zoroaster and his god used the promise of paradise and the threat of perdition to keep their congregations in line and under control. And so it was as well in late Judaism (cf the Book of Daniel) and early Christianity (cf the Apocalypse of John), down to our own day (Seventh Day Adventists, Jehovah’s Witnesses, and that strange celebrity cult of TV evangelists). But whereas the Apocalypse of John (aka the Book of Revelation) was written for first-century Christians under Roman persecution, with figurative references to current events and personages in the effort to encourage their faith and lift their hopes, today it is interpreted against our current world situation, but more for the effect of demonizing enemies and justifying bigotry than bolstering a commitment to the nonviolent way of Jesus. End-time religion is a multi-billion dollar industry, which is odd considering how its message is about the world ending tomorrow. The more insecure people feel, the more likely they are to buy into schemes that promise relief, escape, or a decisive end to their trouble. I’m not really arguing that the Apocalypse is a bunch of hog-monkey, only that taking it literally is. It bears repeating that Zoroaster (along with his Jewish and Christian descendants) was not the originator of this idea of world-collapse and history’s end; it was in the collective planetary consciousness of world cultures both before his time and outside his sphere of influence. He’s the one who took it literally, made it imminent, immortalized the ego and pitched the whole thing into a moral contest for the individual’s postmortem destiny. Prior to and outside of him, the ‘end of the world’ carried very different implications – very different. 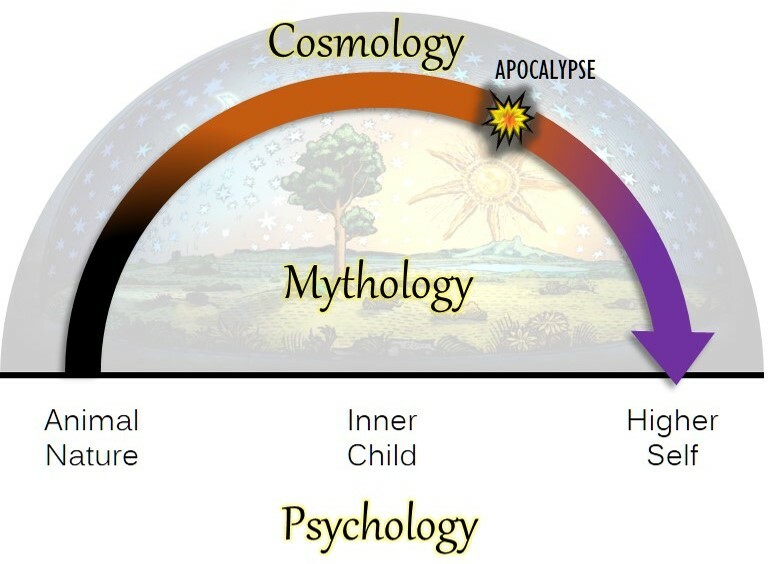 This connection between psychology, mythology, and cosmology might actually help refine our definition of religion – not this or that religion, but religion itself. As the system that ‘links back’ or ties together (from the Latin religare) human consciousness (psychology) and the greater universe (cosmology) by means of sacred narratives (mythology), religion gives us (or once gave us) a way of holding everything together as one coordinated and meaningful whole. The Western advance of science disturbed this marvelous unity-of-experience when it challenged the traditional cosmology. And the stubborn reaction of Christian orthodoxy in denying these scientific discoveries and insisting on the literal truth of its outdated myths only precipitated our slide away from a relevant spirituality. As I said, from inside mythology the Apocalypse will be seen as near or far in the future. Those whose consciousness is still centered in a mythopoetic (storytelling) mode of experience will look out on reality through the lens of sacred fictions. They are oriented on the archetypes, characters, exemplars, and ideals designed to urge their imitation, obedience, and aspiration through the course of their coming of age. From the body-centered psychology of animism and well into the ego-centered psychology of theism, the great myths frame their sense of self and reality. In ancient cultures the Apocalypse was in part a statement regarding the transient nature of existence, along with an imperative on the tribe to ritually renew itself at key points and thresholds along the way. The observable winding-down nature of time required periodic rites of renewal to keep things going. Many of our religious holidays have their roots in seasonal festivals and sacred ceremonies when the cosmos would be wound back up and order restored. But at a certain stage of psychological development, as a rational and reality-oriented intelligence is waking from its incubation beneath the warm emotional covers of mythopoetic consciousness, the stories are recognized as cultural creations and not necessarily as representing the way things really are. For the individual this means that one’s adult higher self is stepping out of an earlier mode of make-believe (the now inner child), in order to acknowledge a reality on the other side of the mythological enclosure, of what we’ve known as ‘my world’ and ‘our world’, that is, the shared world-view of our tribe. And this is the world that comes to an end with the Apocalypse. In other words, what had been interpreted from inside the myth as a future event for the world as we know it, is, psychologically, the moment of realization when an individual begins to understand the world for what it is – a narrative construction of meaning. Such a realization is one-part liberating discovery and one-part shattering disillusionment. The mythological enclosure is gone, and now the present mystery of reality breaks in. It’s not that we’re done with story at this point, only that we are now aware, as we once were not, that our constructions of meaning are exactly, and only, that. Our challenge and opportunity becomes one of working out a relevant spirituality and way of life, together, as the curtain comes down and the lights go on; after our world ends, and on the other side of god.